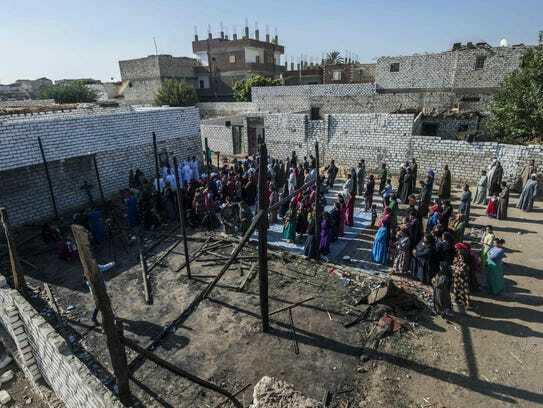 Egyptian Coptic Christians seen in the picture attending Mass on July 24, 2016, in the rubble of a makeshift chapel that was torched a few months ago during clashes in the Egyptian village of Ismailia, south of Cairo. Egypt's Copts make up 10% of Egypt's 90 million people. Residents in the southern Egyptian village of Naj al-Nassara watched in horror as their beloved Archangel Mikhail Coptic Church burned to the ground. The fire in mid-July came amid a rash of recent attacks that have alarmed Egypt's Coptic Christian minority, who blame the government for doing too little to protect them. About 10% of Egypt’s mostly Muslim population of 90 million are Christian — one of the oldest Christian communities in the world. Tawadros told lawmakers that attacks against Christians average about one a month over the past three years. In May, a mob stripped naked a Christian woman in her 70s and dragged her through the streets after her son was accused of being involved with a Muslim woman. On July 5 in Egypt’s Minya district, a 16-year-old girl was allegedly kidnapped by a Muslim neighbor who demanded that her family accept her conversion to Islam. On the same day, a Coptic nun died from gunshot wounds. Authorities said she was caught in a roadside gunbattle between two rival Egyptian clans, but others are not so sure. Egyptian President Abdel Fattah al-Sisi has vowed since taking power in 2014 to bring to justice those responsible for anti-Christian attacks, to repair damaged churches and to widen minority rights. He twice attended Christmas services, a first for an Egyptian president. In speeches, Sisi rejects divisions between Muslims and Christians, saying, "We are all Egyptians." After Sisi met in late July with Tawadros and other Coptic leaders, he affirmed the government’s commitment to preserving Christians’ rights, noting that new housing developments can include both churches and mosques. Church construction is a sensitive issue in Egypt, and some say it could be behind the increase in attacks. "It seems the minister of Interior is just absent," said Meshil Nasef, a civil engineer from Minya, about the agency that oversees police in Egypt. "Our community needs security and peace to be restored." The Egyptian government says it is taking action, but it's not enough to prevent the attacks, Nasef and others said. Police arrested 15 people suspected of setting fire to five Copts’ houses on July 16 in Abu-Yacoub, a village about 140 miles south of Cairo. “The police and firemen arrived at the scene after the houses were destroyed,” said Anba Macarius, the Coptic bishop of Abu-Yacoub. Macarias said the fires occurred after Muslim leaders declared that Copts planned to build a church in Abu-Yacoub, even though the village already has a church and no plans for another one. Christians currently need a presidential decree to build a church, along with approval from the local Muslim community and security services. No similar restrictions exist for building a mosque. Proposed legislation would require authorities to approve church projects within four months after a developer applies for a building permit. The bill, recently introduced by the liberal Free Egyptians Party, also states there can be no suspension of church construction or demolitions without a judicial order. Many Copts are skeptical the measure would address their problems even if it becomes law. "Christians are in real danger," said Marina Ramsis, 21, a theater arts student in Heliopolis, an upscale Cairo neighborhood. "Being different is always a problem, especially in a developing country like Egypt." Marcus Abel Shahid, 37, a Coptic pharmacist in Mari Girgis, an old Christian neighborhood south of downtown Cairo, is angry about the recent violence against his religion. “I don't really expect much from a country whose very system is built upon Islamic law," Shahid said. "I'm saying this in the light of recent tragedies and killings, like the murder of Sister Athanasia who got killed on the highway."